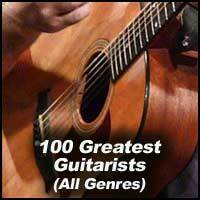 Criteria: These are the 100 greatest guitarists of all genres of music and styles of guitar. 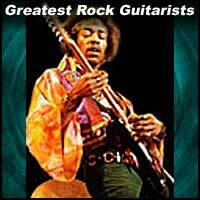 They were picked for their importance in the guitar world including innovation, respect from other guitarists, influence on both other players as well as on styles of playing, impact, legendary status, and overall importance on shaping the guitar world. 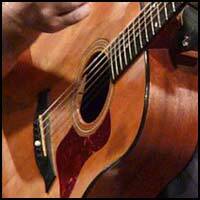 Plus for the playing abilities including technique, creativity, versatility, musicaldepth & expression both in composing & performing, live energy and improv skills, and originality. NOTE: This is a list of guitarists which 'includes' all musical genres. Not guitarists who 'play' all genres. 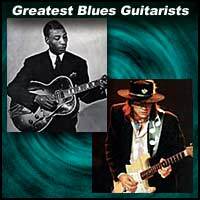 Joe Maphis - "Fire on the Strings"
Django Reinhardt - "The Quintet of the Hot Club of France"
Robert Johnson - "The King of the Delta Blues"
Wes Montgomery - "The Incredible Jazz Guitar of Wes Montgomery"
Julian Bream - "Julian Bream Plays Granados and Albeniz"
Charlie Christian - "The Genius of the Electric Guitar"
Al DiMeola, John McLaughlin, Paco DeLucia - "Friday Night in San Francisco"
Micheal Hedges - "Aerial Boundaries"
Leo Kottke - "6 and 12 String Guitar"
Derek and the Dominoes - "Live at the Fillmore"
John Williams - "Concierto de Aranjuez"
Lenny Breau - "Live at Bourbon St."